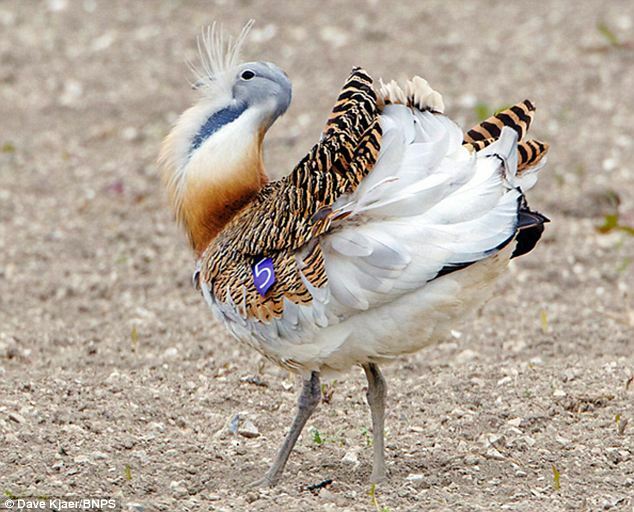 The Great Bustard has featured in yesterdays Daily Mail, treat in an article reporting on the re-introduction project. (Via the Daily Mail). With his chest puffed out and plumage proudly on display, cheapest this fine specimen of a bird once wiped off the British Isles appears to prove the species is thriving on our shores again. The great bustard – the heaviest flying bird in the world – has been gradually re-introduced to Britain using chicks from Russia. Over the last two years the first baby bustards have successfully hatched for the first time in this country in 170 years, helping the species to re-establish itself. Looking fit and healthy ahead of their breeding season, this young male specimen was captured on camera on Salisbury Plain, Wiltshire. David Waters, of the Great Bustard Project, said: ‘Seeing these birds showing off in all their finery is an unforgettable experience. ‘The males have to be about four-years-old before they are fertile and can start breeding with females, so this is probably the first year of breeding for this one.